Composr provides a powerful feature for filtering the user input data given through various forms in Composr without having to change the PHP code. The feature can also influence the default values displayed within form fields. The webmaster can apply this feature via an XML config file that defines the filters. By the end of this tutorial you will understand the enormous power this can give you. The config file is data/xml_config/fields.xml and should be overridden to data_custom/xml_config/fields.xml. You will see there are some default settings in that file, which are designed to be fairly innocuous examples. You can review the default settings as examples. The root XML tag for the config file is fieldRestrictions. Otherwise, the config file mostly consists of restriction tags. Restriction tags (explained further down) can be placed directly beneath fieldRestrictions, but they may also be placed under the special qualify and filter tags. Furthermore, qualify and filter tags can be placed underneath themselves and each other to provide nestings of arbitrary complexity. The qualify tag is used to limit the context under which restriction tags may apply. Without the qualify tag, the restrictions would always apply. minLength, give an error if the field value does not meet the minimum length. This is useful to prevent people posting poorly completed entries. maxLength, give an error if the field value does not meet the maximum length. possibilitySet, give an error if the field value does not match the contained wildcard expression. If you apply the secretive attribute with a value of '1' then the user will not be told what the possible values are, which is useful if you are trying to implement a password (e.g. you can only send me a PT if you use the word "abracadabra" in it). disallowedSubstring, provide an error if the field value contains a match for the contained wildcard expression. This is useful as a blocking word-filter. Unlike the main Composr word filter, you have full qualification and filter support, so it is selectively applied as you require. disallowedWord, as above but will only match whole words. shun, provide an error if the field value equals the contained wildcard expression. This is different from disallowedsubstring simply because it shuns complete matches against the field value rather than substrings. You may give each of these restriction tags an error attribute, which will be used for the case when they trigger. If you do not provide a message a default will be used based upon the restriction involved. replace, replace the value of the attribute from in the field value with the contents of the tag. This is useful if for example you renamed your product and you wanted people to stop using the old product name on your website. If you don't supply a from attribute it replaces everything (see our default news titles example below). removeShout, filter out shouting in the field value (ENTIRELY UPPER CASE FIELD VALUES). This is useful for making a forum appear more civil. sentenceCase, make the field value sentence case. titleCase, make the field value Title Case. deepClean, apply the deep clean process on the field value. Clean common ugly patterns out, such as leading white-space, all-caps, or paste-from-Word problems. This is a potentially disruptive operation, so only use it on data that has been entered by n00bs. append, append something to the field value. This is useful if you want submissions from non-staff to be flagged with a disclaimer message. prepend, prepend something to the field value. With this example posting TEST in a news post title/body would result in it getting changed to Test. Using qualify tags we can therefore focus our filters sharply. It works by applying itself to the type of the main form (add) rather than the type of where forms are submitted to (_add). 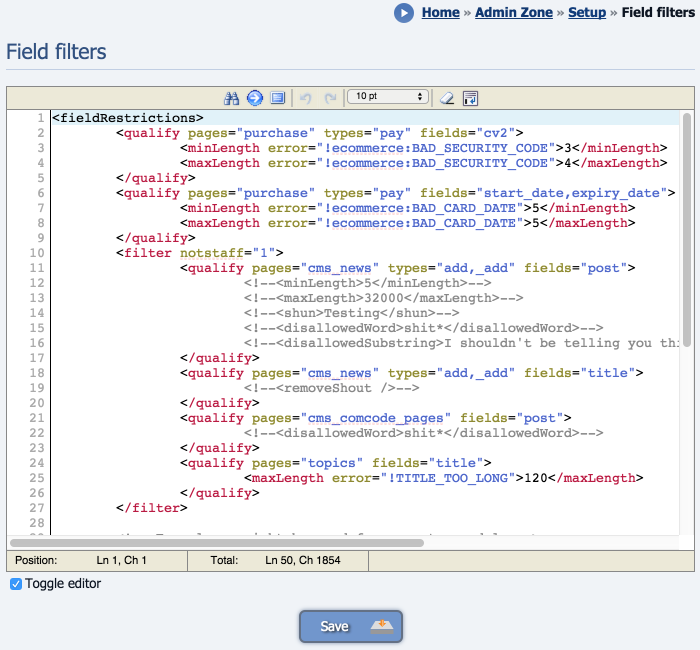 The form field filter system is ripe for extension by programmers. It would not be hard for a programmer to add new filter attributes. For example, a filter could be added to allow filtering based on day of the week, or geographic location. We'd love to see innovative Composr modifications written around this kind of functionality (e.g. a modification to "only allow people to submit a quiz on Halloween from an iPhone").